So, you're sitting in your office. Maybe it’s the morning, you’re on a 1 oclock lunch but it’s only 10:30 and you can feel your stomach starting to ingest itself. It could even be that lunch is over, and you just fancy something sweet to help with the afternoon. Wouldn't it be great if you could have a supply of amazing snacks, within easy reach? If this sounds like you, Office Pantry is something you NEED to check out. 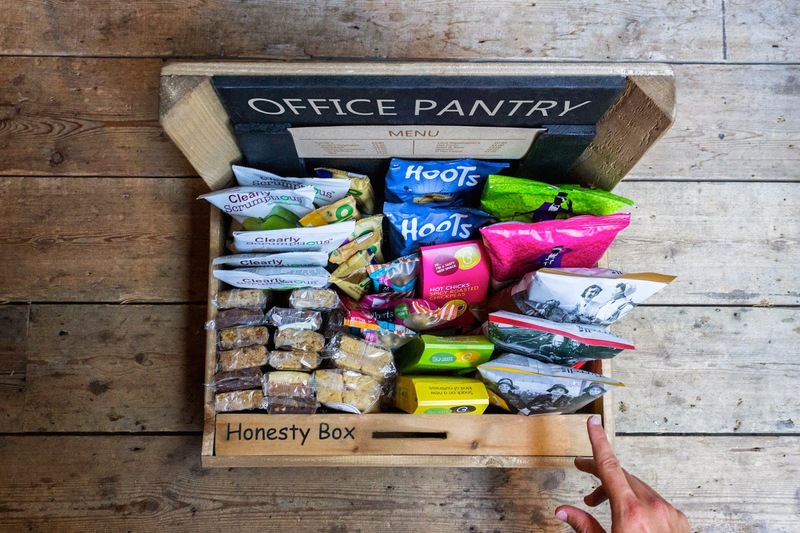 Office Pantry supply snacks to offices across Britain feeding those morning hunger pangs and ridding those 3pm energy slumps. I think this is such a brilliant idea and when I heard about the concept I could imagine it fitting in with my office perfectly. Office Pantry offer a selection of snacks like the ones included in this post. They arrive in a handmade wooden pantry complete with menu and price list for your colleagues. The Honesty Model box is something that interests me the most and the concept works around it being just that, an honesty box. You pay for the box full of snacks (prices start at £35) then your colleagues pay as per the included price list. 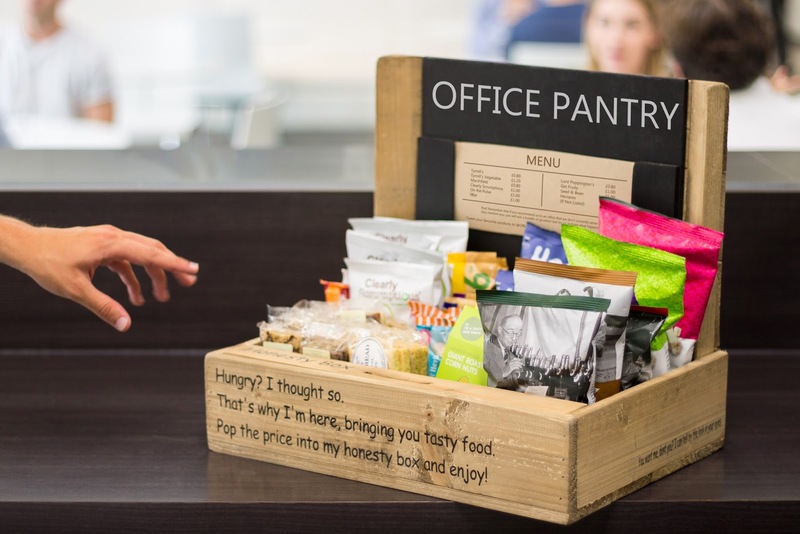 The pantry is delivered directly to your office containing over 35 super snacks so you don’t even have to leave your seat! One of the snacks I fell in love with was these Hectares Sweet Potato crisps. These were AMAZING, words cannot explain. These are also the sort of snack I can imagine eating in the office and everyone else wanting to try them too, as they’re not something you see in every corner shop. They are also Gluten Free which is great as personally we have a coeliac in our office who can’t always eat the snacks we bring in so it’s awesome that there’s something for everyone. You decide what and when they deliver. You can vary what you get in your Pantry and if your colleagues don't like a particular product you don't have to have it again - although judging by the samples I received, I can't see anyone complaining! Another Gluten Free product 9 bars are a great source of energy and a guilt free alternative to a chocolate bar if you want to be a bit healthier. I loved this fruity flavoured mixed seed bar and could easily see myself grabbing one of these after lunch to get me through the afternoon. My favourite snack I got to sample was this Honeycomb Tiffin from Marshfield Bakery. I imagine these would go so quickly. Technically as this is a fridge bar, I like to have mine out of the fridge so it's nice and cold but I couldn't trust anyone with it. It was literally the most luxurious snack I have ever had at work. Lastly, another healthy treat. These dried cranberries (from here) really satisfy a sweet tooth and are one of your five a day and less than 100 calories per bag so you can eat these without feeling like you have to do 3 hours in the gym afterwards. Overall, I am really loving this concept and can really see this taking off in offices everywhere. It's a great idea. You pay for the pantry and box, and get your money back through honesty. Why not pool some money together within your team and try one out? *The snack samples were provided free of charge from Office Pantry in exchange for a review. All opinions are my own. For more information, please see my disclaimer.